Photoshoots are now offsale. To buy a shoot please go to the kiosk on the day of the event. 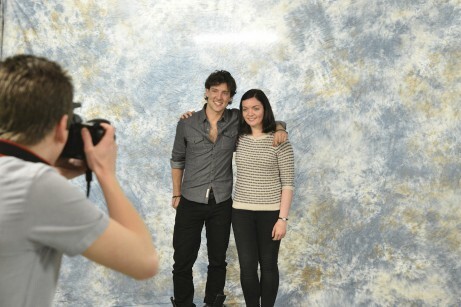 Photoshoots are the perfect way to record the day you met one of your heroes. They’re taken by professional photographers and printed to the highest quality which makes them perfect for framing and cherishing. EM-Con makes it easy to book photoshoots – just check the list below. Once you’ve booked you just have to wait for the photoshoot ticket to be mailed to you and come along to EM-Con 2019 to have your shoot! You even get to collect your photo on the day. Once you have purchased a photoshoot will get a printed ticket to be redeemed at the photo areas, this is for one per person any additional people buying into the photoshoot will also be given additional person tickets with the shoot written on the ticket. Schedules will be posted prior to the convention and on the day, proceed to the photo area prior to the scheduled time. Photoshoots do not cover entry into the event; please ensure you have a valid ticket. Photoshoot tickets are valid once, for either day. Is there a deadline for buying tickets online? The deadline for buying a photoshoot online is midnight on Tuesday 16th April 2019. After this you’ll only be able to purchase a ticket on the day but we can’t guarantee there’ll be any available; for this reason we strongly advise buying in advance. When are tickets mailed out? Photoshoot tickets are sent out after the deadline of 16th April and before 21st April. What time do photoshoots start? Photoshoot sessions begin at 11am. We publish a precise schedule closer to the weekend of EM-Con. Can another person join me in the photo? Photoshoots are limited to the photoshoot ticket holder, but if you want to add more people you can pay to do. You can add a maxmimum of two extra people – meaning 3 people in total (you and two extras). The cost is 50% of the listed photoshoot price. For example; a £30 photoshoot is valid for one person. To add one person will cost £15. To add another will cost £15. The total for three people will be £60 in this example. This can only be done on the day at the EM-Con Photo Kiosk on the upper concourse. Where can I buy on the day? While we recommend buying before the event, photoshoot tickets can be purchased from the EM-Con Photo Kiosk situated on the concourse in front of the main entry point. Please consult the map for directions. Why does it say processing on my photoshoot purchase? Can I save on postage? The website is set up to add an admin and postage fee for every order you make. To avoid this we advise you to purchase all photoshoots you want in one go to ensure this fee is charged just once. Do I get a digital copy? Digital copies will be available online after the event. These will be charged at £5 per download. Can I change my mind on a photoshoot? Unfortunately not; once the purchase has been made we’re unable to change your selection. One advantage of the Gold and Weekend VIP options is that you can change your chosen photoshoot. Can I get a refund on a photoshoot? Unfortunately not; once the purchase has been made we’re unable to give a refund, so please make an informed decision when purchasing. Has my ticket been sent yet? Tickets are not sent until the deadline for buying photos has expired. For EM-Con 2019 this is 17th April. What if I lose my photoshoot ticket? EM-Con sends tickets using Royal Mail Signed For™ – once we send the entry or photoshoot ticket they are your responsibility. We will not replace tickets so please don’t lose them! All group shoots are sold subject to the availability of those guests being at the convention. If a guest cancels we will do our best to replace them We consider 2 guests to be a group.